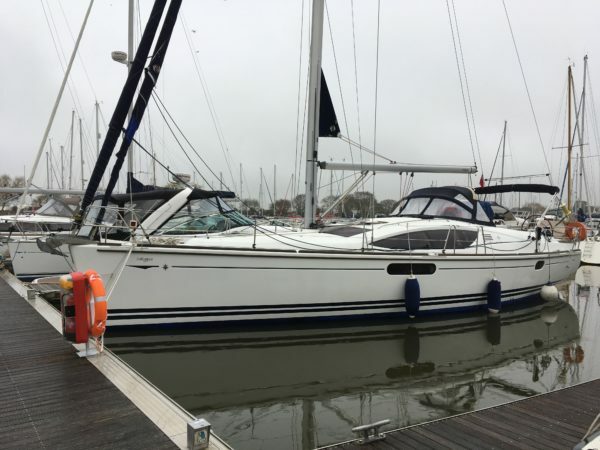 During this spring voyage, the idea was to accompany a couple of British owners who had just bought a Sun Odyssey 45 DS (for Deck Saloon) in the Loire-Atlantique and wanted to relocate her to the south coast of England. The passage from dry harbour “Les Portes de l’Atlantique”, located in Frossay sur la Loire (upstream of Saint-Nazaire) to the port afloat of Chichester (a handful of miles east of Portsmouth) constituted a very technical navigation, comprising currents and “tide gates” as Raz de Sein, the near-permanent proximity of hazards, and intense maritime traffic – not only the fishing fleets near the Breton coasts but also the crossing of the cargo ship lanes, in the extension of the Casquets TSS. Our Sun Odyssey 45 Deck Saloon at her new berth. The passage was quickly made, with a very short stopover in Loctudy, in order to wait for lower winds and to adjust the time for crossing Raz de Sein. The most delicate part, paradoxically enough, was the landing in England : the nocturnal drizzle reduced visibility to fifteen or twenty meters in the sinuous and narrow sound leading to the lock of Chichester. The story ended with the engine at idle, in the glow of the head-lamp, seeking our way in the midst of numerous moorings. The episode was once again the opportunity to confirm that navigating with the nose stuck on electronic charts is likely to lead to a quick grounding in the mud. The imprecision doesn’t come from the GPS itself – at the time of the differential GPS the position it provides is really reliable – but from the chart : nothing on the screen tel us when and how were made the surveys. Channels moves within the years, and old surveys leaves a fair margin of vagueness. With patience and precautions we arrived at sunrise in a remarkably well-kept marina, whose pub serves amazing breakfasts, whose sanitary facilities are worthy of a palace (when one dreams for three days of a hot shower, it matters ), which has a quick train connection to London, and which is bathed by a peaceful atmosphere. Despite its location a few miles away from the Solent, where I sailed rather often, I never heard about this place, which deserves a visit for meany reasons. An interesting discovery, and an address to keep in mind.